Nonetheless, as I continued to watch Toronto's city council meetings, I started to compare Houston and Toronto in terms of their councils, then began to expand my comparison to other major cities. It led me to abandoning Toronto as a comparison city, focusing instead on comparing the councils of the 50 most-populous cities in the United States. See How Houston compares at the bottom of the page. Curiosity arose regarding the number of council members of other cities, the number of people they serve and the amount of area that their districts cover. I also wondered about each city's term limits, whether there were council members that served at large, or whether they solely elected members for given districts. Another small curiosity was whether or not the council members faced the public or faced an officiant during their hearings. At this point throughout my municipal experience I feel that when elected officials and public servants face those that they serve, they foster a more engaging environment for public involvement and input. (New York City, Philadelphia, Chicago, Boston, Baltimore, Milwaukee, Cleveland and Nashville each have councils that face a council president or speaker, not the public they serve. I understand this is most likely due to the local form of government.) It's quirky, but nonetheless, a dynamic of civic involvement and trust. When you think of these data sets and how they may relate to Houston, or any city for that matter, it creates many questions, and should beg comparison to other cities. Houston should not be in a position to be afraid to adopt practices from other cities, or be close-handed regarding changes to how its council functions in order to give its citizens the best representation possible and its council members an appropriate amount of time to complete projects without worry of running for reelection. You see a similar climate in collegiate athletics, where alumni, fans and administration demand instant results on the field or court without coaching staffs being afforded the ability to recruit their own players. The same holds true for local elected officials. They need to know who they're working with, and how to best achieve their preferred outcomes. Yes, terrific coaches can win games, and terrific chefs can prepare culinary masterpieces with what they are presented with (think Iron Chef), but for continued success, there must be an intimate understanding of how your team or entity matches against other competitors. Should Houston institute a four-year term for its elected officials? Before a council member is elected, they have spent nearly a year campaigning, and by the time they learn how the city bureaucracy functions, they are back on the campaign trail to ensure they will be re-elected that next year! It is an undue burden for all of our political leaders, even if you disagree with their political position and motivations. Two years is not enough time to complete quality projects in Houston, as by the time council members develop a project or ordinance amendments, they begin to approach reelection, and must devote their time to other endeavors. At this point, a city council member must wait until their second council term to garner major support for any project. This seems like a large amount of time that could be spent on constituent relations within the second year of the council member's first term. Because of this continual election cycle projects or proposals can sit in the balance because of a lack of time to gain support or political backing. During the annual Kinder Institute Houston Area Survey, Dr. Stephen L. Klineberg and his staff compile responses to various questions regarding the political, physical, social, and educational aspects of the Houston region. 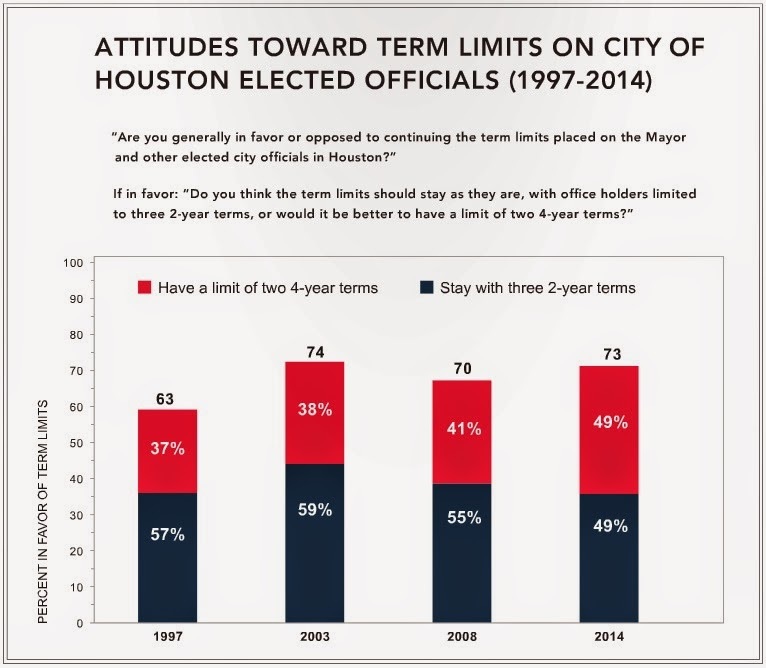 One question that continues to reveal support for longer local office terms explores "Attitudes Toward Term Limits On City Of Houston Elected Officials." 73 percent of those surveyed were in favor of continuing term limits, while the support for two 4-year terms rose to 49 percent in 2014 (page 16). Houstonians are clearly realizing the importance of longer terms. Only six of the 50 most populous U.S. cities have council terms of two years. Austin, Texas has council terms of three years, leaving only seven cities to have terms less than four years. Out of those seven, four are Texas cities; Houston, San Antonio, Dallas and Fort Worth. Should Cities Redraw City Council Boundaries? Fans of the Disney movie The Mighty Ducks might remember what happened with the redistricting of District 5 in the Minnesota Youth Hockey League. District 5, which was the team's name at the time, acquired Adam Banks, won a few games, and made the playoffs for the first time in years. That's a stretch of an example, but there may be many positives that come from modifying district boundaries in a city, or having additional districts created for residents. The feasibility of this happening in Houston is riddled with political and demographic considerations and elaborate requirements for district characteristics. But, council districts with a more manageable number of residents can allow council members to dedicate a greater amount of time and energy in creating more intimate relationships with residents. A more manageable geography alone should be persuasive enough to considering changing council boundaries. In looking at Houston's districts, they act as a "pinwheel" of sorts, with downtown Houston acting as a vertex of sorts, with districts reaching out from Downtown. In Houston's Council District E, Councilman Dave Martin, or one of his staff members, could spend nearly an hour and drive over 50 miles to get from one side of the district from NASA's Lyndon B. Johnson Space Center for a morning meeting to Kingwood's Hidden Hollow Elementary School to speak about civics to elementary school students. Aside from being inconvenient for city representatives to drive regularly, it is also far too long a distance for residents at one end of the district to have similar concerns as those 50 miles away. Austin, Texas recently changed its city charter to allow for ten council districts, represented by one member, as well as a city-wide election for mayor. This is very similar to Houston's council election procedure, however, council members in Austin will serve approximately half of the number of citizens compared to council members in Houston. The City of Austin constructed a website to address the council boundary and redistricting process. The City of Houston conducted a similar process in 2011, creating two additional districts, giving the city 11 districts. The City of Houston has a set of criteria and rules for drawing districts, spelled out on the city's Planning and Development Department's website. As Houston and other cities continue to grow, there will need to be continued consideration given to adding council districts and councilors. That is the only way to ensure that services are rendered properly to residents and that the voices of residents are heard by the rest of council. When Houston added additional council districts in 2011, the population of the city was 2,126,196 residents. 2014 population estimates for the City of Houston reach 2,201,027 residents. This equates to a gain of 74,831 residents in a three-year span. If we can assume Houston continues its grown at the same rate, the city would need to add another council member to achieve the same level of current representation by 2016. There is nothing in the city's charter requiring any additional council members as the population grows. Houston would end up much like Los Angeles in the size and population of their council districts. (There are currently 131,266 residents represented per council member in Houston). How Does Houston Compare in Council District and Council Member Population? Compared to cities of similar population size, Houston sits behind only the City of Los Angeles for the number of people that are represented per council district, and ranks sixth in the number of people per council member, taking into account Houston's five at-large council members. As these numbers indicate, Houston's council members have a large constituent population to attend to. Often, a city's population will forget that at-large council members function in the same capacity as those representing districts, and are most likely underutilized by residents with district-specific concerns. Would cities and their councils be able to attract a more diverse, higher skilled, and better prepared set of councilors if the office of city councilor paid a greater sum of money in most cities? Without a doubt, some cities offer more than a fair compensation for the office of city councilor. However, many major cities have continued to offer a seemingly measly compensation for positions that continuously demand more and more accountability and responsibility, especially as our urban areas grow in population and physical size. Why have cities made it a de facto requirement that city councilors must be retired or have flexible, full-time, high-paying jobs to accommodate the workload required of a councilor? By the nature of the position it may be very difficult for an educated, fairly common civic leader to even ponder serving as a councilor, as opposed to those who have a greater economic independence, or who are popular among specific populations, such as local celebrities or influential citizens, but may not have the educational background that is demanded of many city councilors today. What can be done? Offer more money for councilor positions. the City of San Diego recently attempted to raise city council salaries, hoping to attract a greater range of leadership talent. (Their council ultimately voted against the salary increases.) With a plan like San Diego's there is an increased consideration of the character of council members due to their higher salaries. This creates a greater incentive for those who would then be able to support a family with a city council salary, and a greater incentive for citizens to elect representatives who may truly hold the office of councilor with esteem, as opposed to those who may be competing in a popularity contest. Right now the job of city councilor is so demanding that you'd need another full time job to better support a family with it, given that most salaries are so slow, and some positions are considered part time. The idea of increasing council salaries is becoming more accepted in cities, and is currently being considered in Honolulu, as councilor work is full-time, but their pay is thought of as part-time. There seems to be a slight correlation between the salaries of council members and the quality of life, travel opportunities, leisure amenities and business climate ranking. Using the Bloomberg and Businessweek 2012 rankings of the best American cities to compare against council salaries, there are obvious outliers. Los Angeles, Philadelphia and Chicago are getting a poor value for their expense on leadership compared to their ranking, while cities like Nashville, Oklahoma City and Raleigh get a greater return on their council salaries compared to their ranking. At the very least, it is interesting to consider the geographic and demographic characteristics that make up city council districts within Houston, and see how Houston's council compares to other U.S. and North American cities. Houston is a melting pot of different cultures and backgrounds, willing to adopt other people's point of view. It should be no different in our public administration, and determining what will best serve the city's citizens. Houston City Council - How Does It Compare to Other U.S. Cities? I agree, in order to keep the city running optimally a council member should be added. I hope the government takes account of the issue and deals with it.